Riverfront Park looks very different today than it did to prospectors who arrived in the Central Platte Valley searching for gold in 1858. Greeted kindly by Arapahoe Indians, fortune seekers settled at the “shining mountains” and built tent cities and log cabins amongst teepees. Little gold was discovered here which caused an exodus west to more lucrative sites. This downtown neighborhood later became an amusement park, railroad center and source of inspiration for Beatniks like Jack Kerouac before falling into abandon. Enter East West Partners with its vision of a grandly planned urban community. No surprise this developer has done everything right, including their spectacular redevelopment of Union Station. Riverfront’s buildings and brownstones are architecturally stunning, and while most are high end, dwellings can be had for all budgets. And the views! The spectacular Millenium Bridge links Riverfront Park to all conveniences and nightlife of LoDo. But with its own coffee shops, excellent restaurants and amenities on site and neighboring Platte Street, residents need not venture far. Not far at all – especially with 80-acre Commons Park shining as the neighborhood’s crown jewel and front yard. 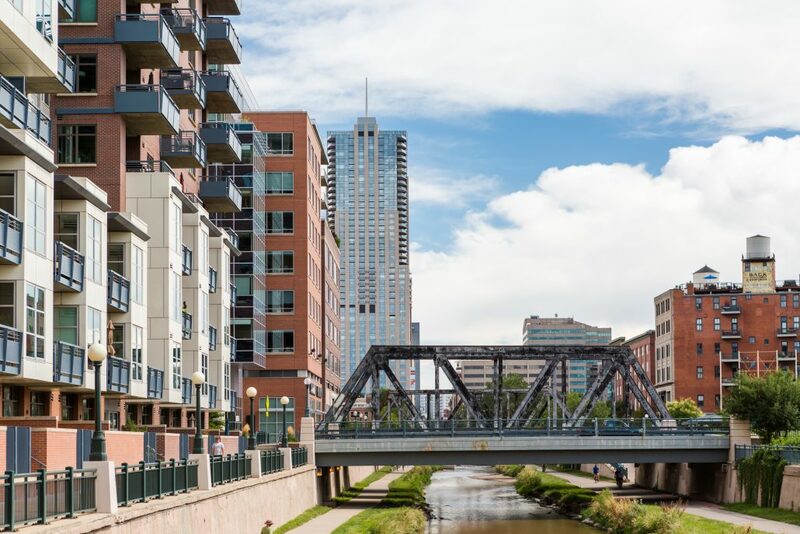 East West is true in saying that “living here means that you can be both an urbanist and a naturalist in the same breath.” A 40-mile bike and running path winds through the Park and the convergence of the Cherry Creek and South Platte River is kayaker heaven. Dogs seem to outnumber people and even Skateboarders have their own digs at Denver Skate Park. Riverfront Park is clean, sunny and its amazing amount of open space makes it feel energized, exciting and different from any other downtown neighborhood. Learn more about Riverfront Park at www.riverfrontpark.com. Sushi Sasa – amazing sushi and they take reservations!